Before I left corporate work I experienced some anxiety that after 15 years my job may have become a larger part of my identity than I had acknowledged, that I might miss some aspect of it when it was gone. Two months out these fears seem to have been unfounded. It is incredibly liberating to be outside a chain of command, no longer a subordinate, free to pursue my own interests rather than those dictated by others. I remember reading about how forests in India regrew as if by magic from the bare earth of severely overgrazed land. The trees had been alive just under the surface all along, putting up shoots that were immediately chewed up by livestock. My brain feels similar. Rather than experiencing any yawning mental void, I can feel the green shoots of my true nature, no longer trampled under the clumsy hooves of a bovine corporate structure, growing and branching out into the light, open space above. During this process of metamorphosis my thoughts have often turned to Peter Mattiessen’s line in ’The Snow Leopard’, in which he likens his dark mood during a period of self transformation to the irritability of a snake shedding its skin, ‘dragging about the stale shreds of a former life.’ In dark moments early on in this process I borrowed and adapted this imagery to imagine a sooty-faced post-apocalyptic version of myself, clad in the last threadbare tatters of my M&S non-iron short and slacks, a partially melted identity badge hanging around my neck on a frayed lanyard. After two months of wriggling I have almost entirely removed those stale corporate scales, and when I look back on this period the 8th of June, the two month anniversary of my first day of freedom, will stand out as a turning point. I’d been down in Aviemore teaching a morning tai chi class at a conference. This had required an early start, but left the rest of the day my own. There was no need to sit in an open plan office until 1700 hrs, filing emails and completing online training about how to complete online training. On the way home decided that I would take advantage of the recent heavy rain to make a packraft descent (possibly a first?) of the River Nairn, from the A9 trunk road to the Nairn Viaduct. In its upper and lower reaches the Nairn is a domesticated river, running through fields with little more than a sliver of riverine woodland beside it. 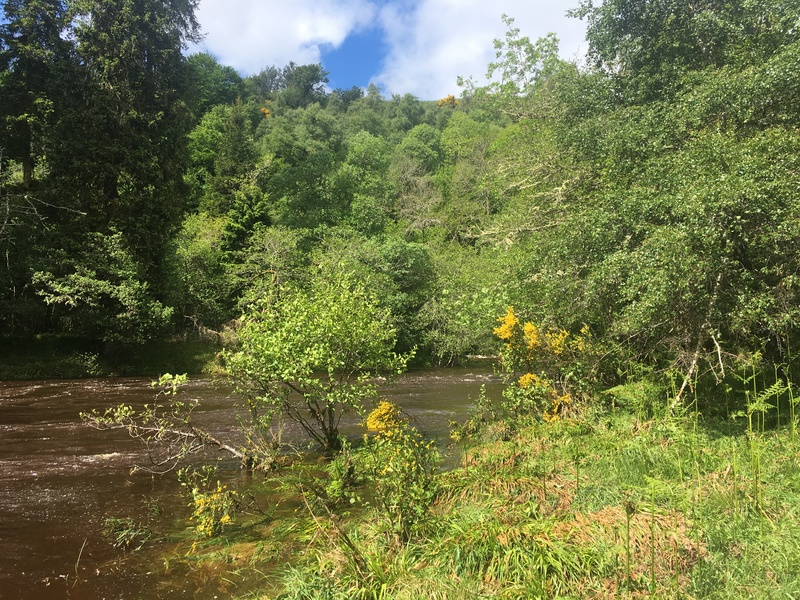 But between the A9 and Nairnside it cuts into the bedrock resulting in a deep gorge, lined with verdant early summer vegetation and rock outcrops. Its inaccessibility made it irresistible to explore. The canoe guidebook rates it as Grade 1 – 2, so I knew that there shouldn’t be any impossible sections, though it did note that there were many trees across the river. My heart quickened as I inspected it from the bridge (see video above), for the sight of the river in spate brought back memories from childhood when I would spend my time after school walking and exploring beside the burn that flowed beside my Dad’s farm. 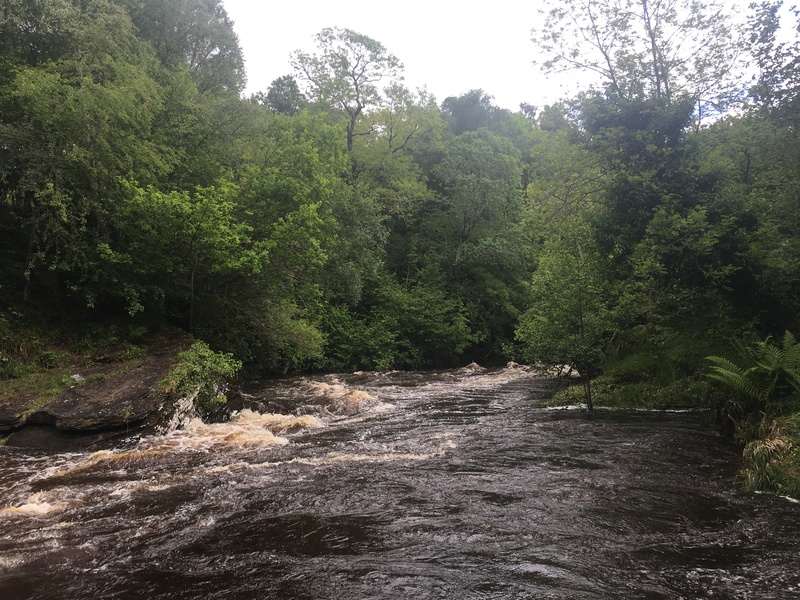 Normally I waded in its placid waters, but after heavy rain it became a terrifying brown torrent and I felt drawn to it even more, so that I could feel the delicious fear that comes from close proximity to a force of nature powerful enough to destroy a human life in an instant. Was I really about to deliberately launch myself into such a flow in a small inflatable boat? There is something about getting geared up for an activity that makes one step outside one’s normal self. And as I stood inflating my boat in the sunshine beside the surging floodwater, dressed in a two piece dry suit with a rubber gasket tight round my neck, neoprene socks inside trainers, a helmet to protect my head from overhanging branches or submerged rocks and a sheath knife attached to the front of my lifejacket in case I had to cut myself free from an entanglement or burst my raft if it pinned me after a capsize, I felt like my purpose was simply to run the river, to test my paddling skills on its fast, choppy water. Right beside my intended put in point there was a stopper – a standing wave – with a huge hole behind it. I didn’t want to risk being sucked into it and capsized, so I went a little further downstream. I felt overly calm, and checked in with myself to try to make sure that this was a sensible thing to do. 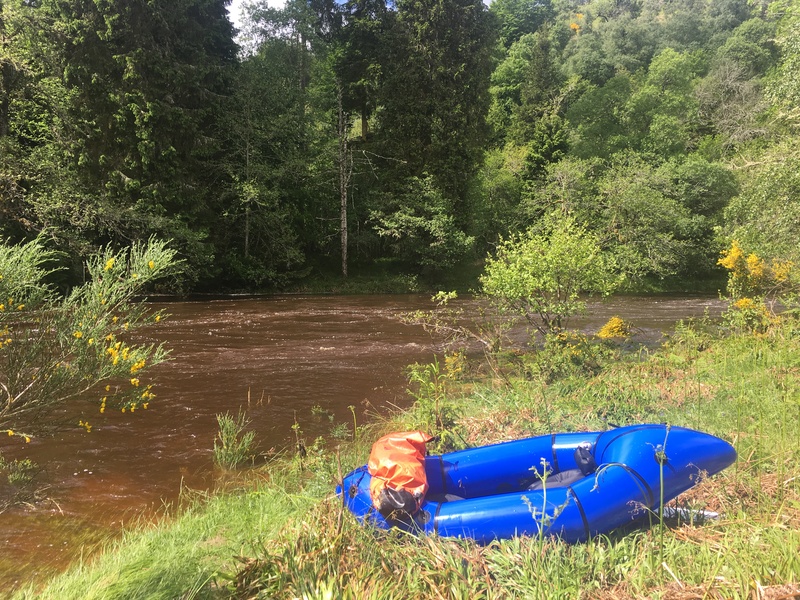 I could always just deflate my boat and start walking home, but I reasoned that the river was technically no harder than the short sections after the weirs on the River Ness, but rather than a few metres of excitement this continued relentlessly for miles. When I got onto the water I found that the waves were bigger than they had looked from the bank. Within about twenty metres, as I passed under the old bridge, I took the wrong line over a stopper, my boat turned across the flow and suddenly I was swimming. Or rather being swept helplessly downstream. I kept hold of boat and paddle and attempted to kick my legs to get into the side. The longer I was in the water the greater the chance of getting snagged on a submerged log. This is why it is dangerous to attach yourself to your boat or paddle, it creates more chance of getting snagged and pulled under. I was several hundred metres downstream when I managed to get out of the flow and scramble awkwardly onto the grassy bank. I took stock of the situation. All my stuff was still with me, even my shades. I was dry and warm, and curiously unshaken. I debated whether I had just had an extremely lucky escape and should count my blessings and retreat immediately, or whether I had established that a capsize can easily be recovered and is nothing to be feared. This question hung unanswered in the air as I left my boat and prospected downstream to see if the next section would tip me out again. As the brain regions that had been colonised by corporate habits and behaviours begin to return to normal service, old, forgotten enthusiasms have begun to blossom into my mind. Amongst these has been an urge to re-read a book that was gifted to me by a young American guy called Ben Wood who I knew when I lived briefly in Buenos Aires back in 2000 (give me a shout if you’re out there Ben! ), Carlos Castaneda’s ‘Journey to Ixtlan’. The book was adapted from Castaneda’s anthropology PhD thesis and described his apprenticeship under don Juan Matis, a Mexican shaman. It’s worth noting that everyone apart from his publisher and the university that awarded his PhD now believe that Castaneda made the whole thing up, and that in later life he became something of a cult leader, so I am in no way endorsing him or his writings wholeheartedly. I do however have some sympathy with Bruce Chatwin’s view that the line between fiction and non-fiction is an imaginary one, invented by publishers. The world that Castaneda creates or documents in ‘Journey to Ixtlan’ is so plausible in its extreme weirdness that I feel it gives some insight into the belief systems of shamanic cultures and, by inference, to the minds of all our forebears. Castaneda’s earlier works emphasised the use of psychedelics, but by the time he got to ‘Journey to Ixtlan’ he had advanced in his training to the point that no plant sacraments were necessary. The book focusses instead on the changes that Castaneda had to make to his behaviour if he was to become ready for the next stage of his journey. Don Juan made three stipulations. The first was that he must erase his personal history, to avoid the problem of people knowing him, taking him for granted and trapping him in “the tie of their thoughts”. The second was that he must abandon any feelings of self importance. The last and most important was to realise that his death was always present. Those who have learned the correct way of seeing can detect its presence, over to their left. Whether you are aware of it or not, one day your death will lean over and touch you, ending your time on earth. This writing resonated with me as I stood beside my boat, with the roar of the water in my ears, deciding whether or not to step back into the fray. In a small way I had followed Don Juan’s three stipulations. I had erased a large portion of my personal history by exiting the corporate world. It was hard to muster much of a sense of self importance standing beside that raging torrent, realising how small and insignificant I was against the power of the water. And after that first swim I had become very much aware of my death. Don Juan lived every day as if it may contain his last battle on earth. He inhabited a world of precise acts and feelings and decisions that was infinitely superior to the blundering idiocy of Castaneda’s life. He taught that one must assume responsibility for being in this marvellous world, in this marvellous time, that one must make every act count since one is going to be here for only a short while, too short a time to witness all its marvels. My logical mind told me that I had bitten off more than I could chew and had a narrow escape. But rather than give into these fears I instead I developed the mindset of a warrior. I regulated my fear so it was no more than a healthy response to a genuinely dangerous situation in which every act is important, in which every battle may be one’s last on earth. Of course this is the case in every moment of every day but it is easy to ignore this reality when cocooned within the trappings of modern life. 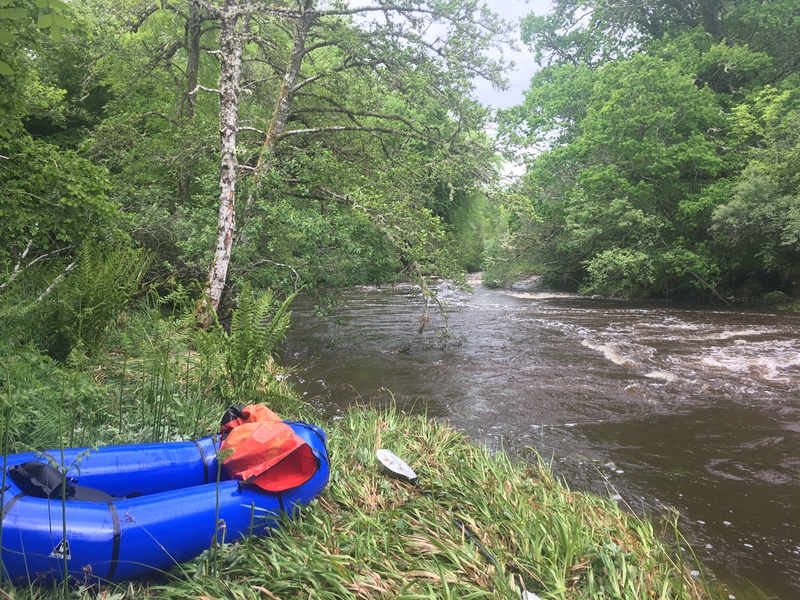 I scrambled down the river banks to inspect a few hundred metres at a time, asking myself if I had the skills to paddle it safely. The answer to that was rarely “certainly”, more usually it was “probably” and sometimes it was only “maybe”. The warrior spirit became most apparent on sections that I couldn’t see and wanted to inspect, but the flow was too fast, sweeping me unprepared into unseen stretches. In order to proceed I had to relax, trust that I could either run it safely or rescue myself if it turned out to be beyond me. Everything apart from boat and river fell away, the colours were so vivid, I was engrossed, the most alive I had been in what seemed like years. It was as exhilarating as an ice climb or a ski descent of a steep couloir. Two hours later when I took out at the viaduct I felt as if I had been immersed in one of don Juan’s amazing and mysterious alternative realities. Though just a few miles from the comfort and security of my home, I had been engaged in what had been without any sense of exaggeration a life or death struggle. I don’t want to give the impression that I had any expectation of death, but I was very much aware of its presence and acutely aware of the need to focus completely in order to mitigate its possibility to an acceptable level. When it was all over I was left with an impression of having stepped through a portal to a different life, that the last of my corporate scales had been washed off in the churning chocolate floodwaters of the River Nairn. I emerged reborn, revitalised, forever changed. That monthly corporate salary: it sure has its price. Like an irritating girlfriend, you’re constantly annoyed by the crap that goes with it, but you really miss it when it stops coming. One thing about not working is that you get plenty of time to party and to spend. So I’m starting job-hunting in order to replenish the coffers. It’s ghastly. At interview you’re introduced to people in skinny ties and bejewelled in oversized watches and novelty cufflinks. What’s with the flat, downward-angled handshake – the sort of hand-shape used to probe the back of the sofa for a lost fiver? And what’s the etiquette to run away just because there’s no way you could work for the knob in front of you? The danger with escaping the situation by feigning brain cancer is that, sod’s law, you end up actually getting brain cancer. Can you get brain cancer by even mentioning brain cancer? Is there even such a thing as brain cancer? I’ve digressed. Perhaps best not to apply at financial institutions – that’s clearly the learning from that experience. Anyway, good luck with your endeavours, man. Peace be with you, brother. Hi Mike – took me a while to spot and approve your comment! I had heard on the grapevine that you are off to pastures new. All the best for your next phase!